SicBo by Gummi Games brings the ancient Chinese dice game of sic bo(also known as Big and Small, Hi Lo, Dai Siu, 大小) to your mobilephone! 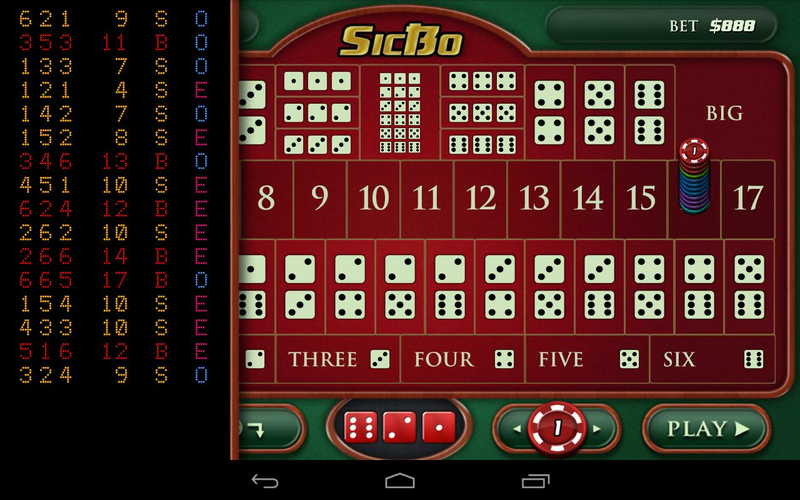 Played in casinos throughout Macau and Vegas, SicBo is ablend of roulette and craps that is simple to pick up and offers aton of betting options--all you have to do is predict the outcomeof the dice! 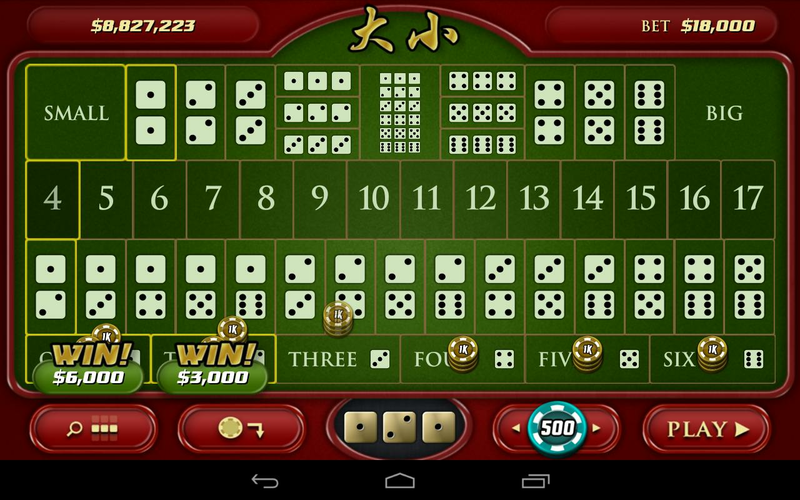 Discover and learn this amazing dice game and workyour way to a virtual casino fortune! 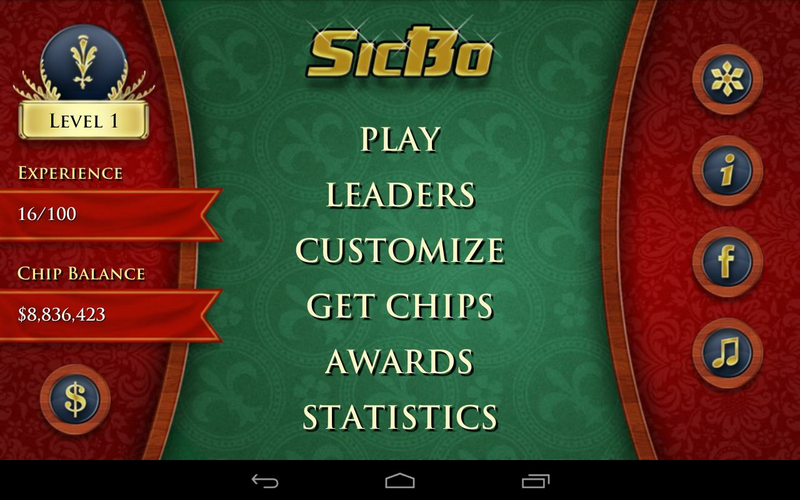 SicBo is ad-supported software and requires Android 2.2+. SicBo by Gummi Games brings the ancient Chinese dice game of sic bo(also known as Big and Small, Hi Lo, Dai Siu, 大小) to your mobilephone! 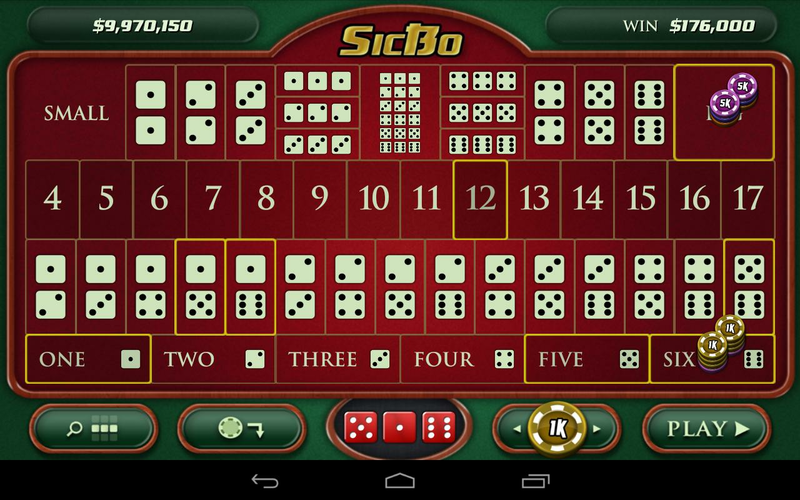 Played in casinos throughout Macau and Vegas, SicBo is ablend of roulette and craps that is simple to pick up and offers aton of betting options--all you have to do is predict the outcomeof the dice! 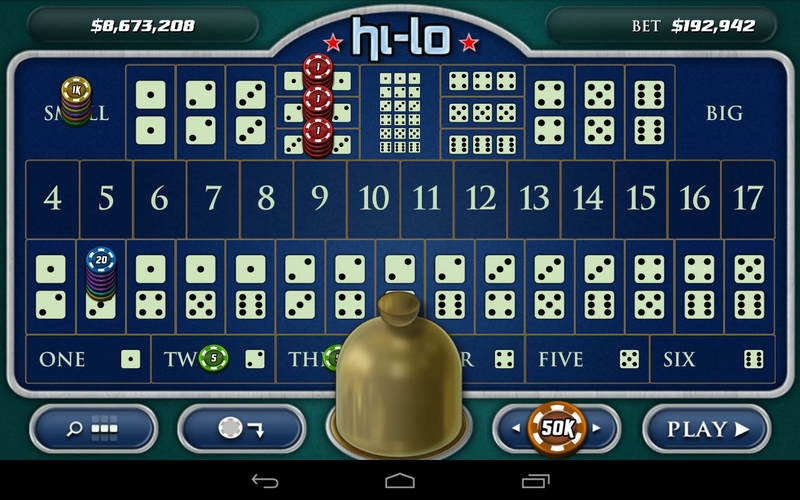 Discover and learn this amazing dice game and workyour way to a virtual casino fortune!Some of SicBo's features include:★ Place multiple bets from $1 to $1 million per hand★ Includes 3 major casino variations: Macau, United Kingdom, andNew Zealand★ Customize your dice, dice cover, and table themes with yourcasino earnings★ Compare yourself with players across the globe on multipleleaderboards★ 25 levels of experience, 40+ achievements with additional cashbonuses★ Introductory help for new players getting started★ Statistics and gambling performance info★ Great graphics on smartphones and tabletsSicBo is ad-supported software and requires Android 2.2+. Baccarat Royale brings the high stakes excitement of casinobaccarat to your Android phone! Baccarat Royale is a simple take onthis immensely popular betting game played in Vegas and throughoutthe world. Features include:* Bet any amount from $1 to the $1,000,000 plaque* Daily cash bonuses and achievements* Buy chips directly or earn chips through offers* Introductory help for new players learning the game* Statistics and Bead Row history* Additional cash awards for inviting friends* Optimized graphics for smartphones and tabletsBaccarat Royale is ad-supported software and requires Android2.1+. 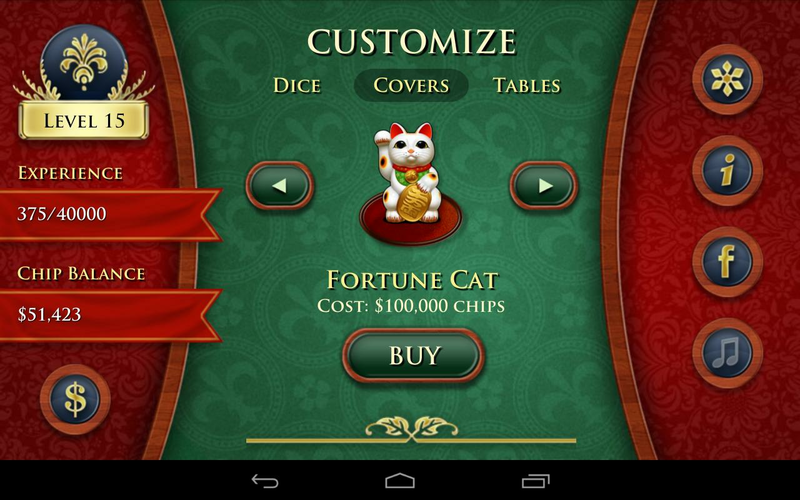 Baccarat Royale brings the high stakesexcitement of casino baccarat to your Android phone! BaccaratRoyale is a simple take on this immensely popular betting gameplayed in Vegas and throughout the world. Features include:* Bet any amount from $1 to the $1,000,000 plaque* Daily cash bonuses and achievements* Buy chips directly or earn chips through offers* Introductory help for new players learning the game* Statistics and Bead Row history* Additional cash awards for inviting friends* Optimized graphics for smartphones and tabletsBaccarat Royale Pro requires Android 2.1+. The ad-supportedversion of Baccarat Royale is available free on Android Market.Please note that statistics and achievements earned in the freeversion are maintained separately and will not transfer over tothis version. Sol2 is the classic card game of KlondikeSolitaire, also known as Patience. Searching for a simple, cleanKlondike Solitaire game that looks and runs great on moderndevices? Solitaire Squared delivers a rich gameplay experiencedesigned for today's smartphones and tablets. With clear graphics,smooth performance, and a variety of game modes, you'll enjoy hoursof fun with this timeless classic.Features:* Play in Landscape or Portrait orientations* Standard or Vegas scoring modes* Solvable/Winnable Games* 1-Touch Gameplay* Game Statistics* Klondike 1/3 Card Deck Draws* HD Graphics & Tablet-ReadySolitaire Squared Free is ad-supported software. Sol2 supportsall devices running Android 2.1+. JunglePop is a matching game similartoBejeweled and Jewels--with a jungle twist! Swap the animalstoproduce a series of pops, and use fruit bombs to popmultipleanimals simultaneously. JunglePop offers children andadultsendless hours of popping fun! Features include:* Standard, Timed, and Infinite game modes* Save and continue your games effortlessly* Tablet-optimized for a full-screen experience* Online leaderboards, local scores and statistics* SD-card enabledJunglePop Free is ad-supported software and works on phonesandtablets running Android 2.3.3 or later. Sol2 is the classic card game of KlondikeSolitaire, also known as Patience. Searching for a simple, cleanKlondike Solitaire game that looks and runs great on moderndevices? Solitaire Squared delivers a rich gameplay experiencedesigned for today's smartphones and tablets. With clear graphics,smooth performance, and a variety of game modes, you'll enjoy hoursof fun with this timeless classic.Features:* Play in Landscape or Portrait orientations* Standard or Vegas scoring modes* Solvable/Winnable Games* 1-Touch Gameplay* Game Statistics* Klondike 1/3 Card Deck Draws* HD Graphics & Tablet-ReadySol2 supports all devices running Android 2.1+. JunglePop is a matching game similartoBejeweled and Jewels--with a jungle twist! Swap the animalstoproduce a series of pops, and use fruit bombs to popmultipleanimals simultaneously. With smooth gameplay, greatgraphics, andamazing sounds, JunglePop offers children and adultsendless hoursof popping fun! Features include:* Standard, Timed, and Infinite game modes* Online leaderboards, local scores and statistics* Save and continue your games effortlessly* Tablet-optimized for a full-screen experience* SD-card enabledJunglePop works on any Android device running 1.5 orlater.JunglePop Free is the ad-supported version and is alsoavailablefor download. ChinChiroRin is an old Japanese game .Please look at thetable.Press the top right corner of the icon.111 is high score.222333 444 555 666 is next high score.456.........123 is the lowestscore.Please try to touch two fingers.Good seeing!123 willdisappear from the dice .Transform Cheating dice.and Jokes dice. Play the wildly popular Liar's Dice with the 138 Liar's Dice App!Whether playing at home or hanging out at the pub, never againworry about having dice at the ready. Grab the free app and bluffaway!- "Peek" feature allows you to take a quick look at your dicerolls, without worrying about other players seeing your rollsduring bidding.- See your dice and cup in beautiful animated 3D! The game of 10,000 is a dice game that is very popular in manyforms. This version uses 6 dice and some criteria may be adjustedto meet the various rules that exist around the world. Rules of thegame:The purpose of the game is to reach 10.000 points.A player canroll dice as long as he obtains points.If a throw gives points, thepaying dice can be put in reserve. The remaining dice can berelaunched or the player can decide to validate his points. Diceput in reserve cannot harmonize any more with the dice of the nextthrow.If all the dice are paying, the player obtains a full hand.He keeps points accumulated during the previous full hand and mustroll all the dice.If a throw does not give points, the tour endsand the score obtained during precedents throw is lost.To put a diein reserve, touch the die or move it in the superior zone of thecarpet.To remove a die of the reserve, move it in the playing zone.Only the dice of the current throw can be removed from thereserve.Counting of points:- Every 1 only one is worth 100 points.-Every 5 only is worth 50 points.- 2,3,4 and 6 only ones are worthnothing.- A suite 1,2,3,4,5,6 in once throw, worth 1200 points.- 3pairs in once throw worth 600 points whatever the dice are formingthe pairs.- A three of a kind ( 3 identical dice) in once throw is100 times worth the value of the die, safe for a three of a kind of1 which is worth 1000 points.- A square ( 4 identical dice) in oncethrow is 200 times worth the value of the die, safe for a square of1 which is worth 2000 points.- A flush ( 5 identical dice) in oncethrow is 400 times worth the value of the die, safe for a flush of1 which is worth 4000 points.- A sextet ( 6 identical dice) in oncethrow is 1000 times worth the value of the die, safe for a sextetof 1 which makes win directly the game.Options:Diverse options areproposed to pigment the game or to adapt the game to the ruleswhich you are used to practising.- Qualifying score: give theminimum score to achieve before being able to go into the game.-Suite 1,2,3,4,5,6: modify the number of points for a suite obtainedin once throw.- 3 pairs: modify the number of points for 3 pairsobtained in once throw.- End at exactly 10000: to win, it will benecessary to reach exactly 10000 points, you cannot validate thescore if you exceed 10000 points. Enjoy the thrill of striking it rich in over 60 authentic FREE toplay slot machines with all the Vegas casino features you love.Make your fortune with HUGE Payouts, Bonus Games, Free Spins andmore! WIN BIG on the most exciting slots game on mobile, tablet andFacebook! Sit back, relax, and have some coins on us with hourly,daily & weekly bonuses! Get lucky today with Lucky Slots! TOPFEATURES: ★ Exciting slot machines with Free Spins, Wilds and BonusGames you won't find anywhere else! ★ Win up to 3 TRILLION coins onour MEGA Jackpot! ★ FREE Coin bonuses every day! ★ Bonus FREE SPINSevery 4 hours! ★ A huge variety of machines with different themesand ways to win! ★ Auto-spin – let the machine do the work for youwhile the coins roll in! ★ Play with your Facebook friends. Sendand receive free coins! ★ Syncs your progress across all yourdevices & Facebook! ★ New machines added every month! Simulatedgambling for entertainment purposes only. This game is intended formature audiences. No real world prizes are available. Practice orsuccess in the game will not translate to real world success. Casino is a fun to play, exciting, quick paced fishing card gamewhere you play against the computer to build, stack and capturemates. Capture the cards from the center by matching or building.Earn points by having the most cards, the most spades, and forevery Ace, the 10 of Diamonds, and the 2 of Spades. The first handdeals 6 cards and every hand thereafter deals only 4. *Whenstacking or building cards, always start from the middle. Ifstacking or building from hand, click the middle card first, thenclick the card from your hand.